New caffeinated products are surfacing faster than I can type – and some of them are disappearing just as fast. Most are more trendy than game changing, but collectively they’re part of a fast-growing industry. Their biggest appeal is delivering caffeine to people and age groups that choose not to drink coffee or tea. These niche products are portable and easy to consume anywhere; some aren’t even liquid, and most avoid tasting anything close to coffee or tea. Here’s a roundup of these big and little buzzers. These products range from ultra-extreme to moderately potent. 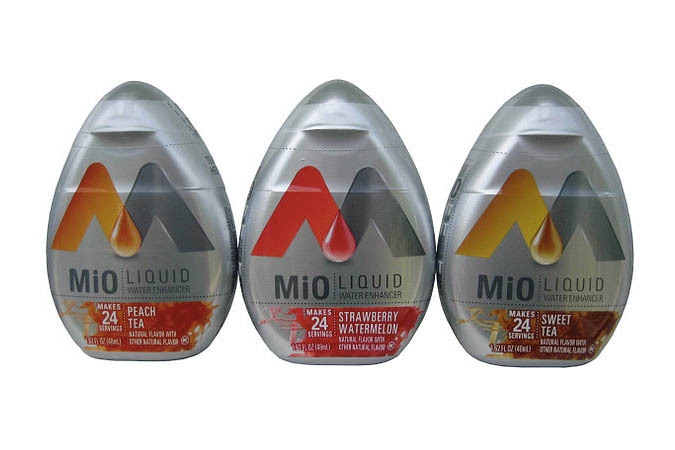 Mio Energy, made by Kraft foods, comes in a cute, droplet-shaped container that fits in your pocket. It’s a “liquid water enhancer” and half a teaspoon adds 60 mg of fruit-flavored caffeine to water, or whatever you’re drinking. “It’s so wild it could get you arrested on a plane, but it’s worth the lawyer fees,” says the website. Hip, edgy ads promote it as an alternative to ready-made energy drinks. It’s sold in supermarkets, minimarts, and gas stations. It’s a lot like self-medicating – add as much as you like, but it’s easy to accidentally add more than you intend. You won’t see these products in 7-Eleven stores or Safeway; they’re way too concentrated to be let loose on the casual consumer. But you can find them online. Mix them into water, other liquid, or food for a nuclear-level caffeine trip. One brand delivers 500 mg of caffeine per ounce – but here’s the real shocker: it’s sold in gallon jugs or larger, and comes with a handy measuring syringe. Definitely pay attention to the warning labels, as this stuff really can be lethal. Anhydrous caffeine powder is white, concentrated, and comes in natural (from tea or coffee) or synthetic forms. It’s easy to buy online, easy to use, and even easier to overdose on. The story of a young man’s accidental death from powdered caffeine is recounted in the next section, Death By Caffeine Powder. Put the end of a lipstick-size canister in your mouth, and get a puff of caffeinated air. 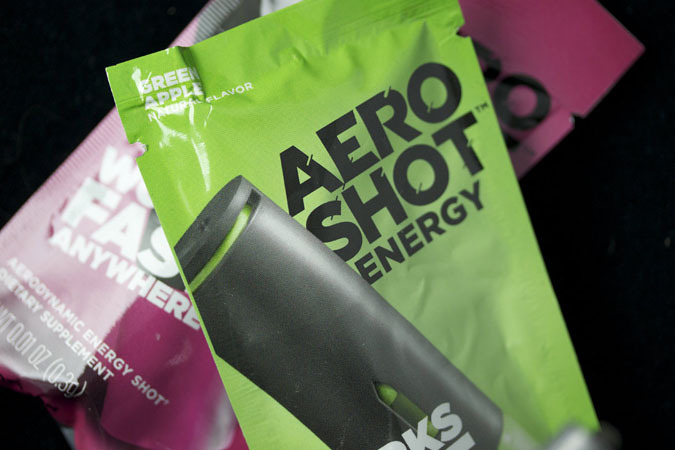 Each Aeroshot canister contains six doses, a total of 100 mg of powdered caffeine (comparable to a cup of coffee), mixed with B vitamins and flavoring. You draw the powder into your mouth and swallow. The powder dissolves in your mouth on impact, so it’s not entering your lungs. 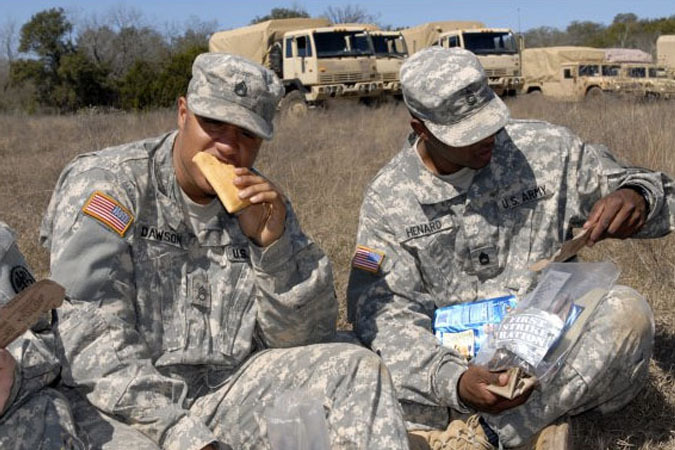 But the FDA is questioning the product’s safety and status as a dietary supplement. A less publicized product, Primer Energy Breath Spray, works similarly, but is more potent: it delivers 33 mg of caffeine per spray; it comes in a larger container with a total of 1400 mg caffeine (about 14 cups of coffee). 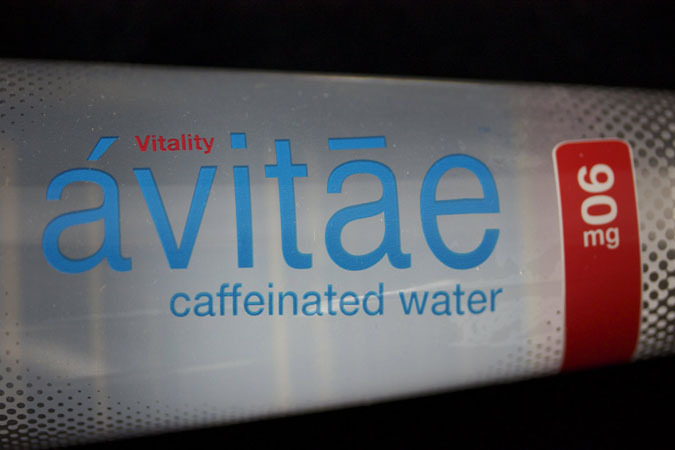 It’s exactly as the name implies: water with caffeine in it. Though not easy to find, most brands may be ordered online. They typically contain about as much caffeine as coffee or tea, or an average energy drink but without the sugar or calories. Some taste like spring water, others have added flavors. If you’re sensitive to bitterness, you may be able to detect the caffeine, but only slightly. 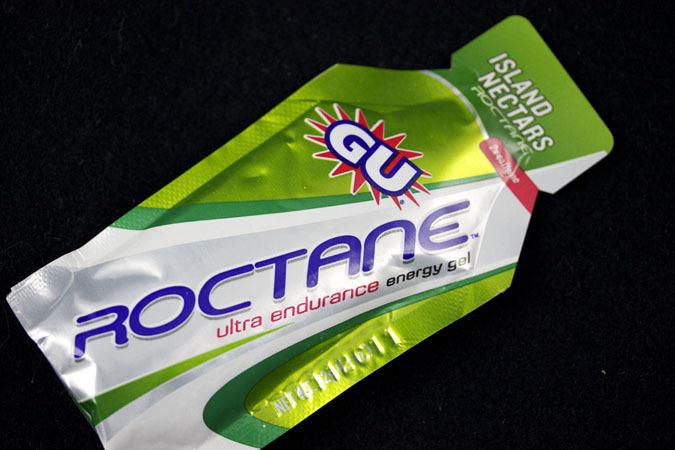 Athletes squeeze energy gel packets into the mouth or pop an energy chew during exercise – as when running a marathon or racing a bike. Energy chews are small, soft candy-like cubes. 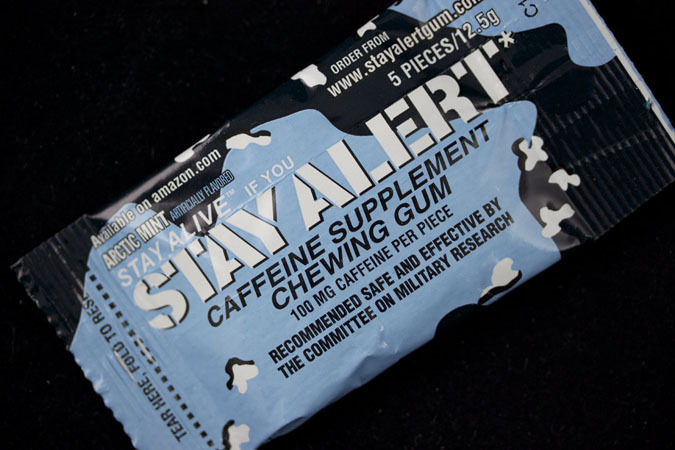 Most gels and chews contain 25-50 mg of caffeine per serving, plus assorted nutrients. Powerbar, Clif, and Hammer are some of the bigger brands. 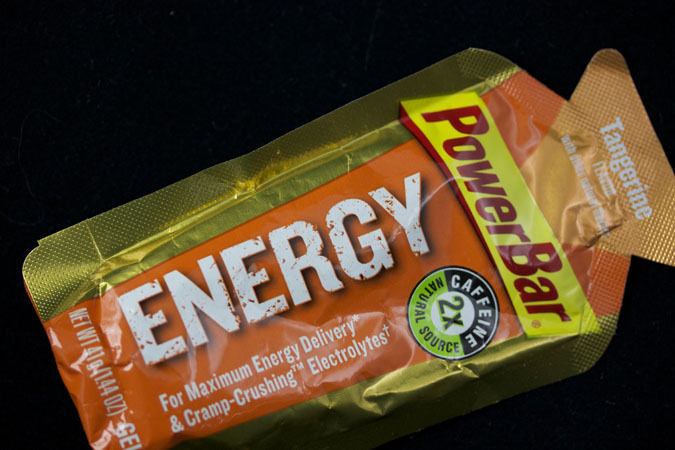 Not all gels contain caffeine; some simply deliver nutritional ingredients. Caffeinated flavors range from coffee and mocha to lemon-lime, grape, and green apple. Use these as directed for a safe, mild caffeinated bump. But some of the products warn of gastrointestinal distress, so test them at home before setting off on a 10K. These are handy for a mild to moderate caffeine bump, especially when liquids are inconvenient (as when driving or traveling). 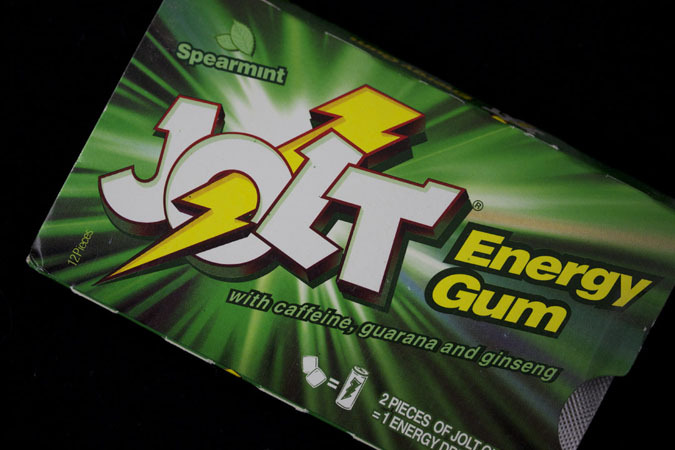 Energy gums range from 35 to 100 mg of caffeine per piece, while mints average about 5 to 7 mg each. Energy strips are like mouthwash strips that dissolve on the tongue (and even taste like mouthwash; yum! 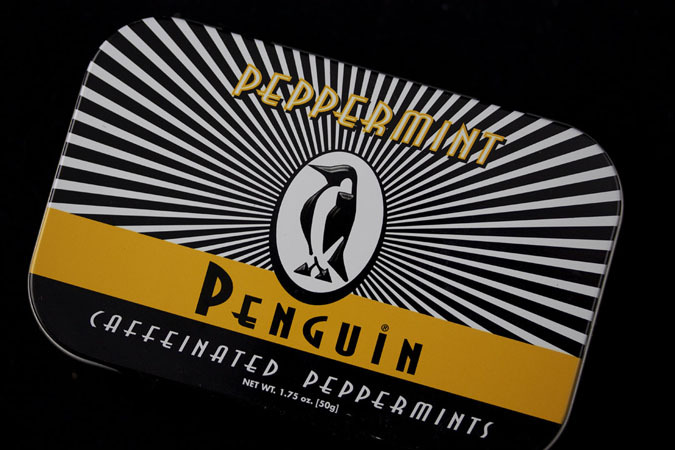 ), and range from 20-40 mg caffeine. You can find caffeine in Perky Jerky, maple syrup, waffles, potato chips, marshmallows, oatmeal and other victuals. 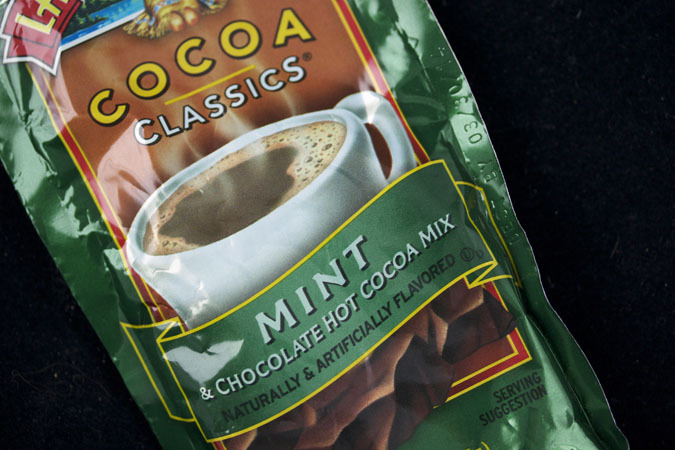 Yes, the caffeine craze buzzes up traditional foods. Caffeine varies by product, so check the websites or labels for amounts. It may not say caffeine on the label, but any food with natural coffee, chocolate or tea contains caffeine. This includes candy, ice cream, pudding, yogurt, cookies, cake, brownies, and even your kid’s cereal. Drugstores stock No-Doz, Vivarin, Jet-Alert and generic brands of caffeine pills. 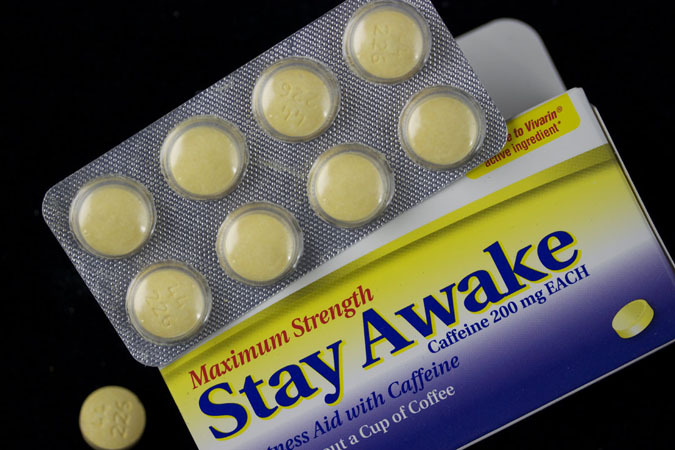 These pills have one purpose: to stay awake. Check the label; most doses deliver 100 or 200 mg of caffeine, about the caffeine in one or two cups of coffee. They make no nutritional claims. Both over-the-counter and prescription painkillers add caffeine for its pain-relieving properties. 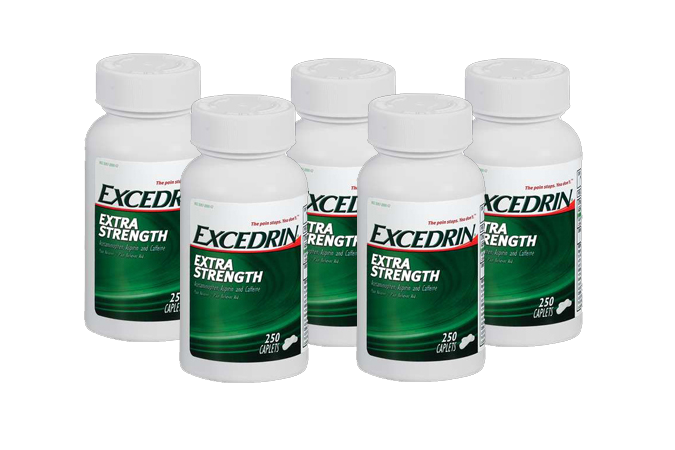 Common brands include: Extra-Strength Excedrin, Excedrin Migraine, Extra-Strength Anacin, Alka-Seltzer Wake-Up Call, Midol Complete, and others. One-a-Day Energy, a multi-vitamin, adds caffeine and guarana seed as energy-boosters. Some people take caffeine pills for weight loss, due to caffeine’s appetite-suppression and metabolism boosting effects. 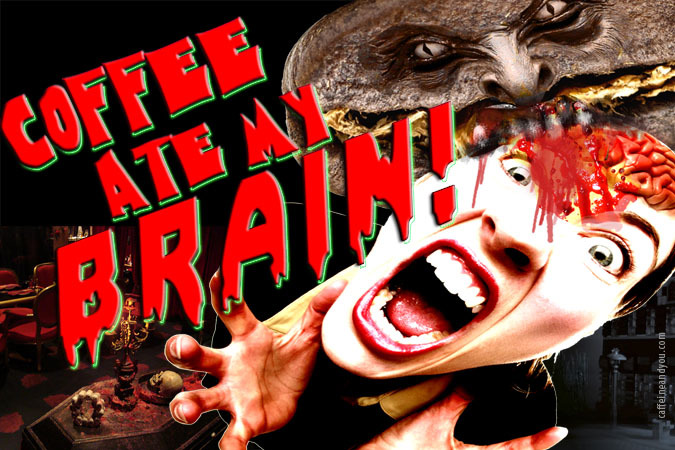 Diet pills containing caffeine are available over-the-counter and by prescription. Research is all over the map on caffeine’s ability to produce long-term weight loss. But plenty of weight-loss products feature it, including such brands as Dexatrim, Twin Labs, Hydroxycut, and various green tea supplements and green coffee extracts. Caffeine per serving in these products ranges from 50 to 400 mg.